Founded in 1997, the Friends of the Wilmington Memorial Library is a membership-based organization with a mission “to promote public awareness of the library and to provide financial support for services beyond the town’s budget.” Follow us on Facebook for the latest Friends news. Meets monthly (September – June). Friends’ members share a common vision of a great public library for our community. By joining, you contribute to making our public library the best it can be. Join online or pick up a membership form in the library. The Friends’ Annual Meeting is scheduled for the third Thursday of March, so be sure to save the date on your calendar! Managed and operated by Friends volunteers, the Book Store Next Door sells gently used books at bargain prices in a small house next to the library. Annually, the group solicits funds for specific library projects, special programs, or new technology. 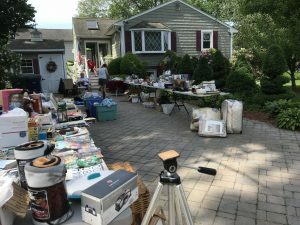 The Friends participate in the Amazon Smile program, which enables people to allocate a portion of Amazon purchases as donations to the Friends group. It’s easy to participate and costs you nothing! 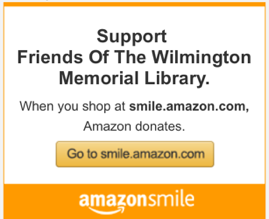 Simply visit Amazon Smile and select Friends of the Wilmington Memorial Library as your philanthropy. Then, use your Amazon account to make purchases as you normally would. Be sure to bookmark the page so eligible future purchases will automatically result in donations to the Friends. The Friends operate a Homebound Delivery service for any Wilmington resident temporarily or permanently unable to leave his/her home due to an illness or disability is eligible. To request home delivery of library materials, please complete the Homebound Delivery Application. You may contact the Friends of the Library via email WMLFriends@gmail.com or call the library at (978) 658-2967 for more information.